It is only fitting in this Twittering age that Smith Magazine, an online magazine devoted to storytelling in all its forms, would invite readers to contribute their own six-word memoirs to the website. 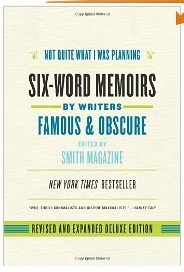 They were inundated with submissions, and it was only inevitable that these would eventually be collected in book form, called Not Quite What I Was Planning: Six Word Memoirs by Famous & Obscure Writers. And some made me laugh out loud. “Editor. Get it?” Yes. There are of course now Six Word Memoirs for Teens (“Met online; love before first sight.”), Six Words on the Green Life (“The meek shall inherit the garbage.”), and Six Words for America (“For every bomb, build a school.”). Smith Magazine’s invitation to contribute your own six-word memoir on the magazine’s website still stands. Myself, I recommend you buy your own copy of the first book and put it where I did: In the bathroom next to the toilet. This is Alyssa from SMITH Magazine, and I just wanted to thank you for the mention! My pleasure, Alyssa! It was a great idea you guys had.